Pre-match: Two of Europe's biggest clubs will do battle for the coveted Champions League trophy tonight as Liverpool meet AC Milan at Istanbul's Ataturk Stadium. The Reds have been the competition's surprise package this season, seeing off Juventus and Chelsea to reach this showpiece and must now summon another big performance to overcome the 2003 winners. The eyes of the football world are directed towards Turkey for the 7.45pm BST kick-off. Pre-match: Rafa Benitez has sprung something of a shock in selecting Harry Kewell in his starting XI, keeping Dietmar Hamann on the bench. It's a bold, attacking line-up chosen by the boss. Milan, meanwhile, are at full strength and Carlo Ancelotti can field the formidable talents of Kaka, Andriy Shevchenko and Hernan Crespo up front. Liverpool XI: Dudek, Finnan, Carragher, Hyypia, Traore, Garcia, Gerrard, Alonso, Riise, Kewell, Baros. AC Milan XI: Dida, Cafu, Stam, Nesta, Maldini, Pirlo, Gattuso, Seedorf, Kaka, Shevchenko, Crespo. KICK-OFF: Milan Baros and Harry Kewell get the game underway. Come on, Reds! 1min: Goal for AC Milan... 1-0. 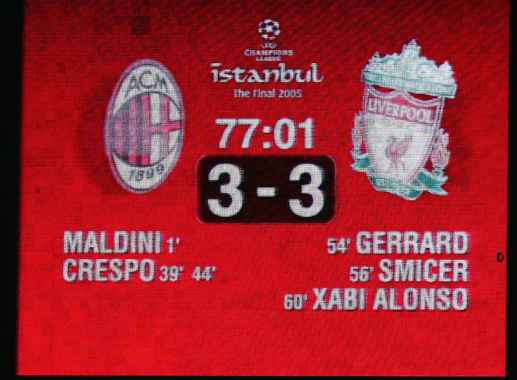 1min: Oh no, it's the worst possible start for Liverpool as Paolo Maldini grabs a goal within 50 seconds here. Kaka drew a clumsy foul from Djimi Traore on the right flank and Andrea Pirlo stepped up to drift the ball into the area. Maldini moved onto the delivery and sent a bouncing volley high into the roof of the net past Jerzy Dudek. Rafa Benitez will be frustrated with that one and the Italians have an incredibly early lead to protect. 2mins: That's the first time the Reds have conceded in the Champions League since the quarter-final, first leg at home to Juventus. 4mins: Decent response from the Reds to falling behind and Baros forces Jaap Stam to concede a corner. Gerrard clips it to the far edge of the penalty box for John Arne Riise to thunder an effort which is blocked by the mass of bodies. It's recycled again and the skipper whips a precise cross into the middle, where Sami Hyypia's header is straight enough for Dida to handle. 11mins: Baros is a willing runner as an out ball up front but the Liverpool manager will be concerned by how quickly Milan have settled into a passing rhythm - Pirlo and Kaka, in particular, are using possession smartly so far. 14mins: So close to a second for Milan! Clarence Seedorf spins a corner to the near post, Hernan Crespo runs off Gerrard and diverts a header on target. But thankfully there's Luis Garcia with what might be his first real touch in the game, to crucially chest away off the line. 18mins: We mentioned Kaka and the Brazilian really is such a danger to Liverpool. A graceful nutmeg on Xabi Alonso was the genesis of a lightning counter-attack there that ultimately ended with the playmaker himself nodding wide to the left. 19mins: Events seem to be conspiring against the Reds at the moment - Harry Kewell is now struggling with an injury. The Australian comes to the touchline to have a word with the physio. He's returned to the field but perhaps not for long. 23mins: Yes, Kewell's evening is over unfortunately. Benitez opts to bring on Vladimir Smicer from the bench. He takes up position on the right wing and Garcia switches to more of a central role. 29mins: Andriy Shevchenko has the ball in the net... but breathe a sigh of relief, he's ruled offside. It comes from Kaka once more, who surges forward and finds the clinical striker in space on the left. Shevchenko curls an instant finish around the palm of Dudek into the bottom corner and the Ukrainian is off celebrating. That raised flag keeps the scoreline at 1-0, though. 38mins: Huge claims for a penalty from Luis Garcia and Liverpool turned down by the referee. Riise cuts open the Milan defence with a smart through ball and as the Spaniard tried to step inside to shoot, Alessandro Nesta appears to stop the ball with an arm. It looked a spot-kick, to be fair. 39mins: Goal for AC Milan... 2-0. 39mins: So cruel. In the space of seconds, the Reds are denied a penalty and find themselves two goals behind. Ancelotti's team launch a rapid counter-attack which sees Kaka wait for the perfect time to play in Shevchenko, who immediately slides a cross into the penalty area for Crespo to tap into the net. Liverpool protest to no avail and they have serious work to do in Istanbul. 44mins: Goal for AC Milan... 3-0. 44mins: Look away now. The Italians have a third and this is turning into a nightmare. Kaka's footwork fools Gerrard around halfway and he dispatches a stunning, long-range pass between the Liverpool defence. Ghosting in from the left, Crespo gleefully matches his run to the delivery and produces an impudent dink over Dudek and home for his second. Kopites are watching through their fingers at this stage. HALF-TIME: The referee calls an end to what has been a terrible opening 45 minutes for the Reds. Benitez's men troop back to the dressing room with their trophy dreams in tatters following a first-minute goal by Paolo Maldini and a quickfire Hernan Crespo brace just before the interval. So, it's fair to say Rafa Benitez has to produce some inspirational words and instructions in the Liverpool dressing room at the break. With that in mind, Dietmar Hamann is already out conducting a warm-up on the pitch and it seems that he will be entering the fray. The travelling Kop are trying to do their bit, offering a defiant rendition of 'You'll Never Walk Alone' that continues as the two sets of players emerge for the second period. And Hamann is indeed added to the mix - the German replaces Steve Finnan and there must be a switch in formation for the Reds here. 46mins: Milan get the second half underway in Istanbul. 47mins: The early exchanges suggest Liverpool have now gone to three at the back, Hamann in central midfield alongside Alonso and Steven Gerrard pushed forward to support Baros. 50mins: Gerrard is already seeing more of the ball and it's helping Benitez's charges threaten. Their latest foray sees a chance for Alonso to train his sights from long range - the No.14 wallops one towards the bottom left corner and it whistles narrowly wide. Unlucky. 52mins: An error by Djimi Traore forces Hyypia to bring down the onrushing Kaka just outside the area. Shevchenko takes control of the set-piece and smashes a shot that needs a strong save, diving low to his left, from Dudek to keep it at three. 54mins: GOAL FOR LIVERPOOL! Gerrard grabs one back and it's 3-1. 54mins: The Reds have a goal and of course it's the skipper and what a header. Riise's initial cross from the flank is blocked by Cafu so he curls in another and Gerrard is first to it, leaping into the air to arc a stunning header into the top corner from 12 yards out, with no chance for Dida. The midfielder runs back to his own half, gesticulating to teammates and fans to push on. 56mins: GOAL FOR LIVERPOOL!! It's 3-2! 56mins: Where did this come from? Liverpool strike twice in as many minutes, with this one from substitute Smicer. Possession is passed all the way across the field to the Czech, 20 yards from goal, and he tries his luck with a rasping drive which Dida gets hands to but can't keep out. Milan are flailing slightly and the Reds have momentum. 57mins: Huge noise emanating from Kopites around the ground, who have hope all of a sudden. 60mins: GOOOOAAAAALLLL!!! This. Is. Incredible. Xabi Alonso steps up to the spot and after his penalty is brilliantly saved by Dida, the Spaniard follows up to fire the rebound into the roof of the net. Gerrard had won the spot-kick, surging into the box and preparing to shoot before Gennaro Gattuso fouled him. Against all the odds, a miracle has unfolded - it's 3-3 at the Ataturk. Three goals in six minutes for Liverpool. 61mins: This surely has to be the most dramatic final in European Cup history. Hard to believe what has happened here. 63mins: Still the Reds keep going, they're so much more confident now, and Riise lets fly with a typically powerful blast that Dida pushes away and eventually collects. 70mins: Danger for Liverpool as Dudek carelessly fumbles a Kaka cross and Shevchenko pounces to clip an effort on target. But Traore importantly read the situation and got himself back on the goalline in time to clear the striker's hit. Superb defending. 75mins: We're into the last 15 minutes and this match is so delicately balanced. The Reds are moving the ball with confidence and composure, although Milan have recovered their resolve at the back and clearly remain an enormous threat in the other direction with Shevchenko and Crespo to tee up. 80mins: And there's the warning... Shevchenko bounds past a series of tackles and finds his strike partner in space behind the back three. The Argentinian assesses his options and searches for the supporting Kaka, but Jamie Carragher launches a fine challenge to block out the midfielder before he can convert yards out. 85mins: A number of substitutions to report. Liverpool swap Djibril Cisse for Milan Baros, while Hernan Crespo is replaced by Jon Dahl Tomasson and Serginho takes to the field for Clarence Seedorf - Milan's first changes of the night. 89mins: Shevchenko is coming back to life and another rapid dart through the middle draws another important Carragher tackle. Jaap Stam meets the incoming corner and glances on dangerously, but Kaka can't divert into the net at the back post. Relief for the Reds. 90mins: Two additional minutes to be played in this incredible final... and probably a further 30. Yes, that's it for normal time in Istanbul. We're going to extra-time to decide the 2005 Champions League winners. 91mins: Cisse and Garcia get extra-time underway. 97mins: It appears that the captain's switch to a more defensive role is designed to keep out the pace of Serginho along the left. One expert tackle there suggests it could be a wise move by Benitez. 101mins: Great opportunity for Milan, who are worryingly dominant at the moment. Serginho swings in a brilliant cross from deep toward Tomasson - but, with a possible slight touch from Traore to put him off, the forward can't make proper contact to concern Dudek. HALF-TIME IN EXTRA-TIME: No goals to report but it's all Milan with 105 minutes played and Smicer ended the period notably struggling with cramp. 106mins: The Italians kick off the second half of extra-time. Can either side find a winner or are we heading for a shootout? 110mins: Sensational defending by Jamie Carragher as the local time moves beyond midnight. Serginho takes advantage of space to swing a cross right into the six-yard box, but the Scouser stretches out a leg to stop a simple tap-in. He's suffering cramp too, incredibly. Milan now throw on Rui Costa for Gennaro Gattuso. 115mins: Pirlo again has a set-piece scenario on the left edge of the Liverpool box. He's looking to find a teammate, but Garcia deflects the delivery. The Reds are having to hang on ever so slightly. 118mins: WHAT A SAVE! Jerzy Dudek keeps the dream alive with an outrageous double stop. Another Serginho cross finds Shevchenko - the striker's low header is pushed out by the 'keeper but the Ukrainian has the goal gaping on the rebound. Somehow Dudek gets his body in the way as Shevchenko smashes it yards out and the ball balloons into the air and out. How did he do that? 119mins: Dare we say it... it begins to feel like Liverpool's name is on the trophy when you see moments such as that. 120mins: One last chance for the Reds as Smicer wins a free-kick 20 yards out, but the training ground routine doesn't work as Riise's eventual blast is blocked. END OF EXTRA-TIME: That's it, penalties are required at the Ataturk Stadium. Serginho is first up for Milan... and he's blazed it over the bar!! Dudek was jigging along the goalline and may have put him off. Advantage Liverpool. Didi Hamann steps up... brilliantly curled into the left corner! 1-0. It's Pirlo next... saved!! He didn't look confident and Dudek palms away an effort that was too straight. The goalkeeper is channelling the spirit of Bruce Grobbelaar with some of his antics here. Cisse for Liverpool... 2-0! Great take by the forward, side-footed home. Tomasson for Milan... drilled into the net. It's 2-1. Riise is third for the Reds... oh, it's pushed out by Dida, who sprung to the right to save. Still 2-1. Kaka... levels the shootout with a lofted spot-kick. 2-2. Smicer... excellent penalty and the Reds are back in front. The Czech fist-pumps after making it 3-2 to Liverpool. And now Shevchenko has to score... BUT HE DOESN'T! LIVERPOOL ARE CHAMPIONS OF EUROPE AGAIN!!! Post-match: Three-quarters of the ground erupts and Steven Gerrard and his team sprint towards Dudek as the realisation hits that they have won the Champions League. Rafa Benitez shakes hands with Carlo Ancelotti - neither manager will be able to quite explain what has unfolded this evening. This has been unbelievable and like nothing we have ever seen before. From 3-0 down and seemingly well out at half-time, the Reds responded to equalise the contest at 3-3; they clung on and Dudek's double save from Shevchenko ensured penalties. The Pole was the hero there too, stopping Pirlo and the Ukrainian from 12 yards. 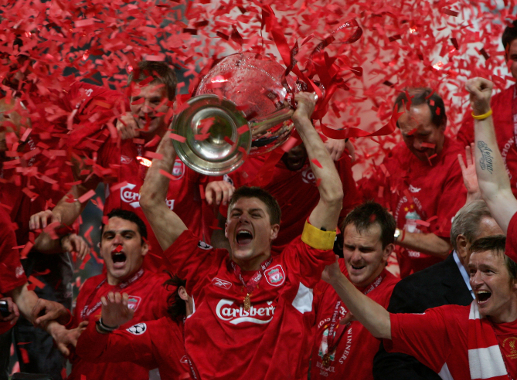 Post-match: Gerrard is about to become only the fourth man to lift the European Cup as Liverpool captain. The local lad was the Reds' heartbeat tonight, playing in at least three different positions, and he follows in the footsteps of Emlyn Hughes, Phil Thompson and Graeme Souness. And, of course, this time the trophy - the club's fifth - is for keeps. And here it is... Gerrard hoists aloft the coveted silverware and the entire team joins him in celebration. What a night. Post-match: "It hasn't sunk in," says Gerrard on the pitch, as 'You'll Never Walk Alone' rings around the stadium. "At 3-0 down at half-time, I thought I was going to be in tears after the final whistle. I can't sum up how good I feel at the moment - I'm just on top of the world. The manager said at half-time to keep our chins up and try to score early; I think that was the turning point. I had nothing left and all of the boys had nothing left. But we stuck in there and fought and showed everything that got us to the final. I can't describe how good I feel. The fans are the 12th man - they deserve this trophy just as much as the players. I'm made up for everyone."